The first page of the Hebrew original of Ben Sira to be identified in the modern era, by Solomon Schechter in 1896 – now located in Cambridge, bearing the shelfmark CUL Or. 1102 = MS B IX, recto and verso. For more about this discovery, click on 'Introduction'. 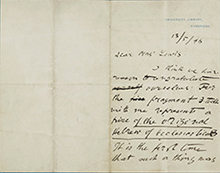 Used by kind permission of the Syndics of Cambridge University. 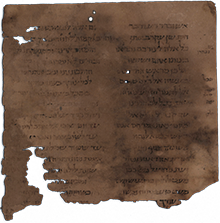 Welcome to www.bensira.org, the website devoted to the ancient and medieval Hebrew manuscripts of the book of Ben Sira. These documents, which are housed in Cambridge, Oxford, London, Paris, New York, Los Angeles, and Jerusalem, are here presented in a single platform, to allow the scholar and the interested layperson to view these precious texts. 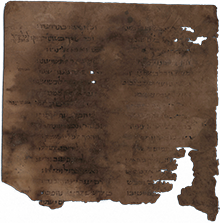 To learn more about the remarkable recovery of the once-lost Hebrew original of Ben Sira, and its presentation at our website, click on 'Introduction'. To proceed directly to the images of the disparate manuscripts, click on 'View the Manuscripts'. We invite you to explore, peruse the website, and learn more about the book of Ben Sira, its contents, and its textual history. 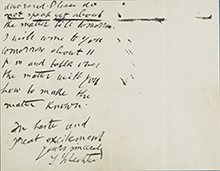 The handwritten note from Solomon Schechter to Agnes Lewis, dated 13 May 1896, informing her that he has identified 'a piece of the original Hebrew of Ecclesiasticus' (underscore in Schechter's letter). Click here for more information.